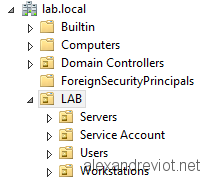 Sometimes, you need to create a lot of Organization Units into your Active Directory. To do this, you can use the Active Directory Users and Computers but it can be quickly time consuming depends on the number of OU. Hopefully, Microsoft integrated a powershell module with Active Directory. So, we can create a script to do this for us. Name : The name of the new Organization Unit. Path : DN Path of the parent Organization Unit. In order to create OU automatically from the CSV file, we will use an Active Directory built-in cmdlet: New-ADOrganizationalUnit. Call the cmdlet to create OU in Active Directory with information. In case of error, like user rights or bad parent path, it will display the specific error. # Description : Powershell script creates OU into Active Directory from a CSV File. # Remarks     : CSV file must contains Name and Path. New-ADOrganizationalUnit -Name "$OUName" -Path "$OUPath"
Write-Host -ForegroundColor Green "OU $OUName created"
If you check the change with ADUC, you will see that all OU in the file had been created. You could get more information about New-ADOrganizationalUnit cmdlet here. This entry was posted in Active Directory, Powershell, Scripts and tagged active, ad, directory, Organizational, ou, powershell, Unit. Bookmark the permalink.